Our first “Mendo” wine! 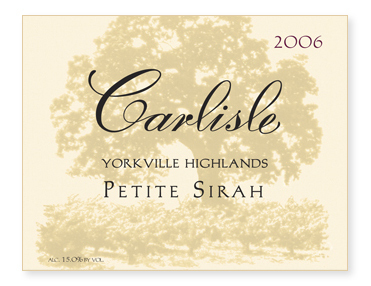 Yorkville Highlands is one of California’s newer, smaller (in terms of planted acreage) appellations. Located in Mendocino County, between Anderson Valley and Sonoma’s Alexander Valley, the AVA consists of 40,000 acres of bench land ranging from 1000’ to 2200’ in elevation. While only approximately 400 acres are currently planted, red Rhône varieties (including Petite Sirah) have already proved very successful here, thanks in part to warm days and very cool nights. Picked October 31st, clusters and berries were so small that they made Pinot noir look big. Aged in French oak, 22% new, and bottled unfined and unfiltered.